Chrome producer Tharisa has struck a five year deal to supply Chinese steel group Tisco (Taiyuan Iron & Steel Group Company) with about 25% of Tharisa’s metallurgical grade chrome concentrate production from September 2017. The deal is to supply a minimum of 240,000 t/year of chrome concentrate at market prices to Tisco JV partner Shanxi Taigang Wanbang Furnace Charge Company (Shanxi) through a “strategic co-operation agreement” . Tharisa CEO Phoevos Pouroulis commented that, “Tharisa is pleased to have formalised its relationship with Tisco, a long-term client. The co-operation agreement further cements our position in the Chinese market and underpins our order book. Chrome prices have been volatile over the past year reaching highs of around $338/t before correcting to levels around $147/t. That volatility has been reflected in the Tharisa share price which collapsed from nearly R29 in March this year to levels around R12.40 by the end of July before staging a partial recovery in recent weeks to levels around R14.50 which is approximately where the share stood a year ago. 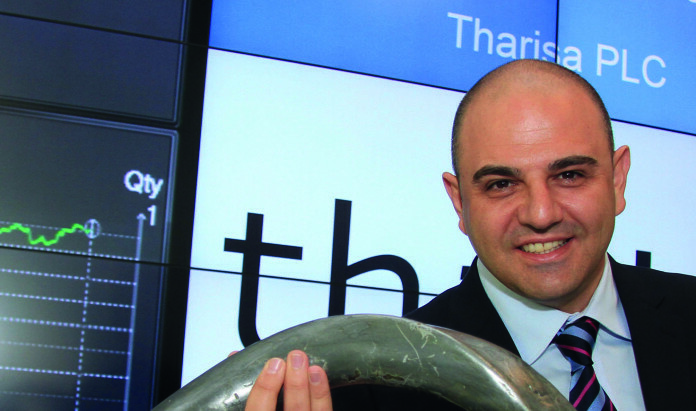 In May, Pouroulis told Miningmx the challenge for Tharisa was to prove it could be profitable “throughout the cycle” and not just when the price of chrome went crazy. Tisco produces about 4mt of stainless steel annually and typically purchases about 1mt of ferrochrome each year to feed its steel mills. It also produces around 300,000t /year of ferrochrome from the Shanxi JV. According to Tharisa, Tisco is considering a phase two expansion of its ferrochrome sintering and pelletising plant which would increase ferrochrome production to around 450,000t/year and so increase its requirements for metallurgical chrome concentrate.